Smokin Joes Pipe Tobacco features aged Virginia flue-cured tobacco blended with double toasted burley & Maryland tobacco. Many smokers say it has a smooth sweet taste with excellent burning qualities. The moisture level is closely monitored for this blend ensuring when it will not burn too quickly and will deliver a satisfying smoke. 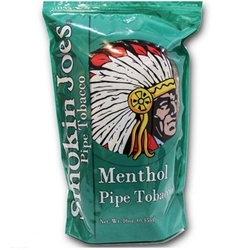 Smokin Joes is the First Native American-Owned and Operated Tobacco Manufacturer, located in Lewiston, NY on the Tuscarora Indian Nation.